Around 100 years ago, when steam power was still the dominant vehicle propulsion system, the mass production of gasoline engine cars started. Shortly after, gasoline internal combustion engines became the de facto powerplant of choice and have remained so to this day. Inoue believes that LEAF, which begins customer deliveries in December 2010, has the potential to change the history of automotive world once again. Like he said, a bit of pressure. “It has to be a ‘real-world car’ that can be appreciated by conventional car users comfortably” and, at the same time, “has to be an iconic design that can be identified as an EV instantly." In addition, the proposed development schedule was unlike any design project in Nissan history. The period for design development was only around six months from initial sketch, to multiple proposals on quarter scale clay models, to the final 'go with one' decision. "Quick decisions by executives and the teamwork of project members who already had trust in each through working together for a long time is what made it possible," recalls Inoue. “I believed that we could design a car that has a friendliness of daily ‘bread and butter’ while achieving the iconic styling that projects the joy of owning an environmentally responsible electric vehicle. I think in the new LEAF we’ve accomplished that goal"
LEAF’s exterior styling, which follows a design concept called “Smart Fluidity,” may give the impression of an ordinary 4-door passenger car. If you look closer, however, you will find various EV-unique features. LEAF’s hoodline is kept low, since there is no large engine inside. The long, up-slanting LED headlights contribute to low wind noise. Underneath, the flat floorpan and rear diffuser, like utilized on racecars, are made possible by the absence of a traditional gasolinepowered vehicle’s mufflers, exhaust pipes and propeller shaft (front engine/rear-wheel drive). “The headlights, especially, are designed to cleverly split and redirect airflow away from the door mirrors, thus reducing wind noise and drag,” explains Inoue. “We have worked closely together with R&D and tested in the wind tunnel to achieve this. And, the headlights provide yet one more benefit – they consume about 50 percent of the electricity of conventional lights. This is critical because electric consumption in an EV is as important as fuel consumption on conventional cars." In terms of interior packaging, LEAF’s innovative compact lithium-ion batteries are installed under the floor, contributing to the secure cabin space and low center of gravity. The instrument panel not only offers the features necessary for EV driving, but also instantly displays convenient information such as cruising range status. 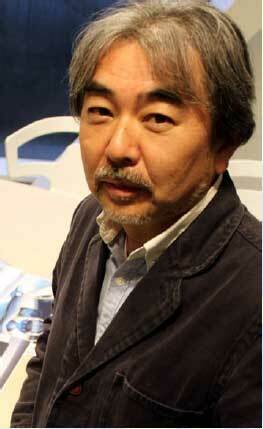 Inoue recalls the challenges in designing the interior. “When we made a proposal using a close-to-final interior mockup, Nissan Chairman and CEO Carlos Ghosn asked us, ‘Why am I not sitting in the center?’ ‘Why do we have all these dials on the dashboard?’ He felt that the interior needed to match the same level of innovation in its design as the EV technology underneath. While we didn’t go as far as to make the driver’s seat in the middle, we immediately redesigned the interior from scratch, teaming up all the key members from Nissan Design America and Nissan Design Europe." In order to make the innovative interior design a reality, Inoue and his team negotiated with top engineering executives to develop the all-new gauges, audio/navigation/climate control panels, steering wheel and shift knob, which required a huge investment. Unlike common practice, the LEAF design team took an active role in developing key components. “We created the 3D drawing data, using our own software, to make a proposal to the engineering group. We wanted to make an innovative, mouse-like shift knob, which was possible using the by-wire technology which is unique to an EV," said Inoue. A few years later, around the start of the decade, Inoue became a chief designer of Exploratory Design, charged with creating various concept cars including Ideo (2001), Effis (2003), Pivo (2005), Pivo 2 (2007), Mixim (2007) and Nuvu (2008) – all electric or fuel cellpowered vehicles. The exploratory design group not only created the styling of these concepts, but conducted intensive research into what the future social environment would be, and how the cars were going to be used by that time. For example, Ideo in 2001 already featured “city browsing,” an augmented reality (AR), displaying geo-tags on the screen showing actual views of the city. The Ideo also featured “Around View Monitor,” a parking support technology showing an artificial image of the vehicle from above generated by CCD cameras installed on the car. The advanced Around View Monitor system is now available on a number of production Nissan and Infiniti vehicles. Another key technology developed for electric vehicles is "by-wire," which replaces traditional mechanical links in drivetrain systems, such as steering and shifting, with electronic links. "Ultimately, we can separate a vehicle’s cabin and chassis using by-wire," says Inoue. "We created the Pivo concept as a 'car you don't need to back up' by rotating the cabin, so that the users can easily understand the benefit of this technology." Another advanced Nissan electric vehicle technology being developed is In-wheel Motor (IWM), which installs a motor inside the wheel. It was demonstrated in the Pivo 2 concept. “By creating the Pivo 2 concept, we wanted to express the benefit of IWM and by-wire technologies,” explains Inoue. “This enables the four wheels to move independently. Thus the car can even move sideways, in addition to cabin rotation. It makes parking much easier and can even change the center of gravity when cornering." 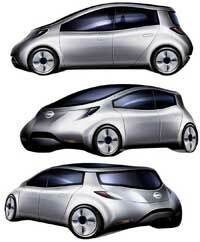 In 2009, another team in Nissan Design created the innovative Land Glider. This unique concept uses by-wire technology to emphasize driving pleasure, one of the Nissan's key values, by allowing the body to lean just as the motorcycle when cornering. EV-enabled technologies, such as by wire and IWM, are greatly changing basic vehicle configurations – unleashing them from the design restrictions found on the conventional gasoline engine-powered cars. Through designing the concept cars, Inoue has studied both innovation on automotive technology and subsequent changes in society. Along with designing LEAF, Inoue and his team have created animation footage for such topics as “Life with EV,” “Information Technology on EV, ” and “Charging Infrastructure for EV” to share the values and benefits not only among designers, but also with R&D members of the project. This activity is continuing even after the design of the LEAF is completed. "I am expanding my ideas beyond the car itself, and making proposals to various functions in the company, including the marketing and infrastructure development teams. I hope that my experience designing the concept cars can contribute the successful launch of the LEAF," concludes Inoue. Joined Nissan in 1979. Studied at Art Center College Of Design (Pasadena, CA) in 1983. Engaged in various passenger cars including Bluebird (U12), Maxima (J30/J31), Sentra (B13), and Stagea(WC34/M35) Became Chief Desinger of Exploratory Design Dept. in 2001, managing advanced design on future products and concept cars for autoshows. Appointed Product Chief Designer in 2009.